Start with a $200 credit limit after a deposit of $49, $99 or $200. After 5 monthly on-time payments, get access to a higher credit limit and start building credit with no additional deposit. See the rest of the best secured credit cards. 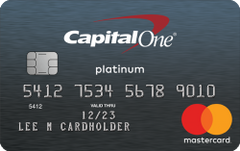 Our take: Despite the lack of a rewards program, the Capital One Secured Mastercard’s low security deposit, reasonable fees and shorter pathway to a higher credit line makes it a good option for credit-building consumers.